The monsoon rains upon which farmers in the southwestern state depend for their food and livelihoods dumped two-and-a-half times the normal amount of water across the state last week, according to Indian meteorologists. It is difficult to attribute any single extreme weather event — such as the Kerala flooding — to climate change, said Roxy Mathew Koll, a climate scientist at the Indian Institute of Tropical Meteorology in Pashan, near Mumbai. At the same time, “our recent research shows a three-fold increase in widespread extreme rains during 1950-2017, leading to large-scale flooding,” he told AFP. Across India, flooding caused by heavy monsoons rainfall claimed 69,000 lives and left 17 million people without homes over the same period, according to a study he co-authored, published last year in Nature Communications. In Kerala, all 35 of the state’s major reservoirs were brimming with rainwater by August 10, forcing local authorities to open the sluice gates on the Idukki Dam for the first time in 26 years. 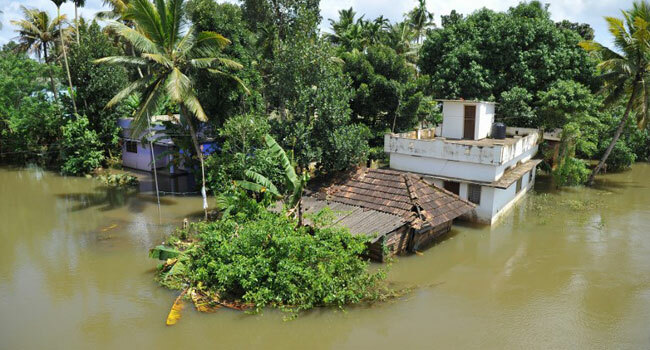 “These floods that we are seeing in Kerala right now are basically in line with climate projections,” said Kira Vinke, a scientist at the Potsdam Institute for Climate Impact Research in Germany. “If we continue with current levels of emissions — which is not unlikely — we will have unmanageable risks,” she told AFP. The weather patterns behind these destructive downpours are well understood, even if the fingerprint of global warming is still hard to distinguish from what scientists call “natural variability”. Rapid warming in the Arabian Sea and nearby landmass causes monsoon winds to fluctuate and intensify for short spans of three-to-four days, Koll explained. During those periods, moisture from the Arabian Sea is dumped inland. “Over the last decade, due to climate change, the overheating of landmass leads to the intensification of monsoon rainfalls in central and southern India,” said monsoon expert Elena Surovyatkina, a professor at the Russian Academy of Sciences, and a senior scientist at PIK. The changes observed so far have occurred after an increase in Earth’s average surface temperature of only one degree Celsius (1.8 degrees Fahrenheit) above pre-industrial levels. On current trends, India’s average annual temperatures are set to rise 1.5 C to 3 C compared to that benchmark by mid-century, according to a World Bank report entitled “South Asia’s Hotspots”. “If no corrective measures are taken, changing rainfall patterns and rising temperatures will cost India 2.8 percent of its GDP and will drag down living standards of half its population by 2050,” the World Bank said in a statement. The 196-nation Paris climate treaty calls for capping global warming at “well below” 2 C (3.6 F), and 1.5 C if possible. But voluntary national pledges to reduce greenhouse gas emissions, even if respected, would still see temperatures rise at least 3 C.
Flooding is not the only problem India’s burgeoning — and highly vulnerable — population will face as a consequence of global warming. “What we will see with climate change in India is that the wet season is going to be wetter and the dry season drier,” said Vinki. If manmade carbon emissions continue unabated, some regions in northeast India could literally become unlivable by the end of the century due to a deadly combination of heat and humidity during heatwaves, recent research has projected. Indeed, large swathes of South Asia, including the Ganges-Brahmaputra Basin, could approach the threshold for survivability outdoors. Coastal cities, meanwhile, are especially vulnerable to sea level rise, driven by melting ice sheets and expanding ocean water, on the one hand, and subsidence due to over-development and the depletion of water tables, on the other.